For years movie audiences have recognised the fallacy behind remakes. Just because you have CGI, beautiful people with quality nose jobs and arty music video directors who know how to do pretentious very well does not mean you have the necessary tools to better Lawrence of Arabia. Why not re-release the original on the big screen instead, with some additional cleaning of visuals and re-mastering of sound? A remake is largely unnecessary when a classic is a classic. The same arse-backwards logic regarding remakes has, however, slowly infiltrated the gaming industry. With retro pixels and sprites being the new black and white and duly considered not good enough for the modern audience, fond memories of Syndicate, Speedball 2, Flashback and Sensible Soccer have been slightly tarnished by remakes closely resembling arse-biscuits. Why not just re-release the original Amiga versions on modern systems instead already? Well, that’s exactly what Mastertronic and Abstraction Games have done with a conversion of The Bitmap Brothers’ wonderful The Chaos Engine to PC. The so-called restoration adds some additional spit and polish alongside neat modern features, but in pretty much every way this is the Amiga version (with CD-32 sound) that most retro gamers know and love. It’s just on the PC. Yay! 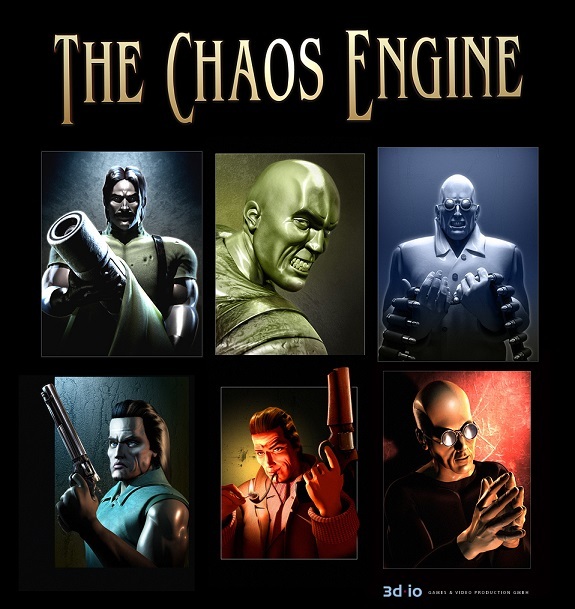 For those 19 year-olds that know little else beyond Modern Warfare, FIFA and frequent masturbation, the original Chaos Engine was released in 1993 and followed the tried and tested Bitmap Brothers formula. An eye-catching visual futurism of metallic sheen and muted colours combined with a thumping instantly recognisable soundtrack. Such quality presentation, however, was fused with substance. In this regard the co-op mechanics, level design and challenge available made for some rather exquisite 2D top-down, run-and-gun gameplay. Whilst co-op was a perfect medium for squabbling brothers to learn about teamwork, the single player co-op provided a delightfully intelligent computer companion to journey with. Indeed the stonkingly good A.I. makes Resident Evil 5’s Sheva blush with embarrassment! The opening level was relatively simple to plough through but only the foolish expected it to remain so linear and direct. Stages branched into a myriad of mazes, hidden areas and alternative exits with the varied pathways, treasures and power-ups resulting in vastly differing gameplay experiences. 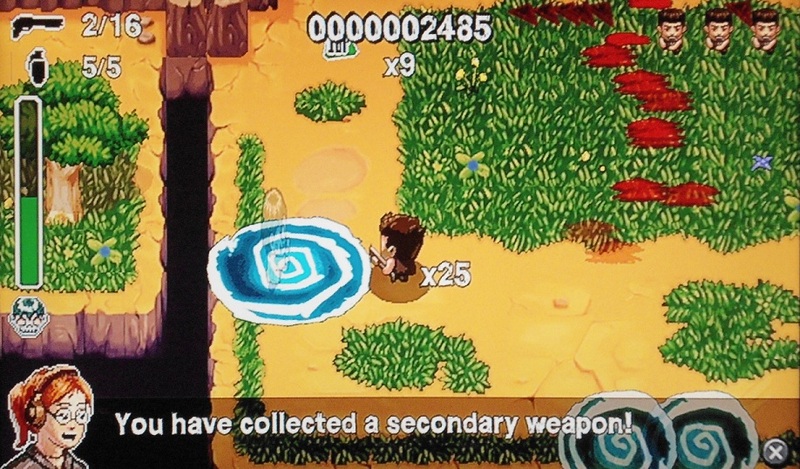 For instance, the more cash collected the more one could beef up their character every couple of stages via an RPG levelling system and skill tree. 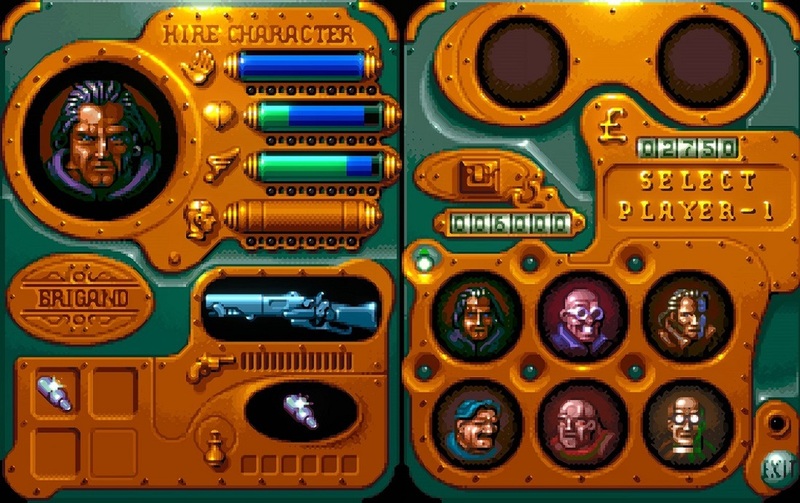 Of course, working out the most effective route through four complex worlds took time and with a whole host of tough enemies standing in the way of progress, defeating The Chaos Engine was a substantial yet rewarding undertaking. The very good news is all of this remains the case in the PC version; very little has actually been tweaked. Enemy routines and level maps are identical. There are no additional characters to choose from, just the original six established classes (Brigand, Mercenary, Navvie, Thug, Gentleman and Preacher). Most importantly Richard Joseph’s majestic audio is untouched. From the now legendary ‘node activated’ to the classic opening music, it would have been criminal to replace these with something new and spangly. There are some minor in-game tweaks relating to The Chaos Engine’s visuals but these barely (if at all) affect gameplay, can be turned off as necessary and hardly re-invent the look of the original game. It’s more a case of smoothing down the rough pixelated edges and brightening up the look from the Amiga’s limited palette (which actually distracts from the clever emphasis of the original’s metallic dishevelled feel) than attempting any kind of deviation. 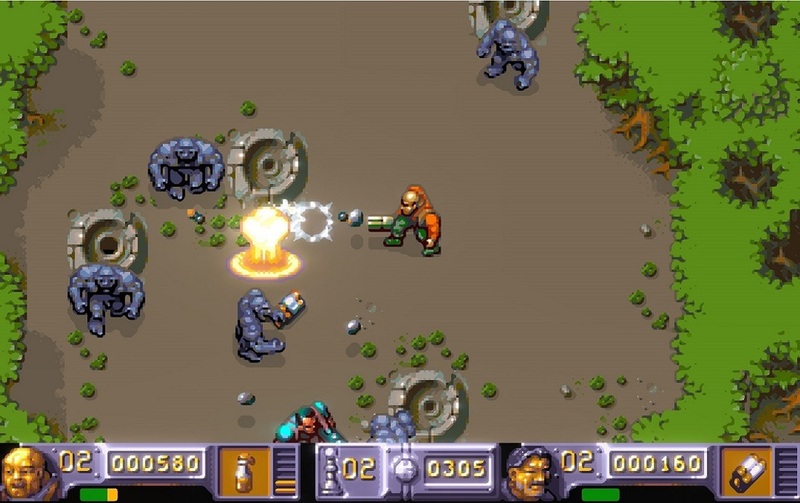 The only other difference is a shift to 16 way multi-directional scrolling for the player characters but not enemies, although this doesn’t appear to make this release unbalanced – The Chaos Engine is still particularly tough. Any flaws in the game are, therefore, pretty much peculiar to the original 1993 release. The fourth world being a little more linear in design has always meant the final levels feel a little flat compared to the complexity of previous stages. Saying that, the restoration does appear to be easier in the challenge it provides. This is no doubt down to the more frequent save points that have been implemented alongside the originals password system. Progress seems more assured and less stifled and probably explains why at the time of writing I have the third highest score on the single-player leaderboard! But whilst this is the only addition that appears to directly influence gameplay, this in no-way means The Chaos Engine is now an easy game. It still kicks ones arse on a regular basis. If you die it’s typically because you did something moronic to invite death. ...And what's better than a big weapon? Why, a bigger one of course! If The Chaos Engine is now slightly less difficult than before, the inclusion of modern gaming phenomena sure helps to make up for any reduced longevity. Achievements encourage multiple play-throughs with the varied character classes and the online leaderboard is the perfect way to test your metal against other players. I for one will certainly be carrying out further runs to get closer to the two guys currently at the top of the leaderboard. 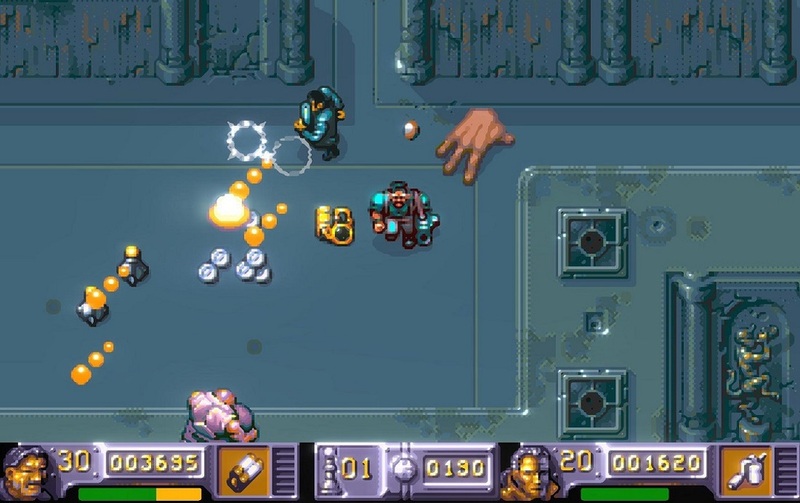 Likewise, online multiplayer is a wonderful inclusion specifically as the days of bedroom gaming against siblings is beyond the likes of most 30-somethings from the Amiga generation. Although it’s worth noting that there remain some lag and latency issues with the multiplayer (which will hopefully be rectified in further patches), this has the potential to be a further match-winner for the re-release. Playing The Chaos Engine on the Amiga, for those who have the means, remains an absolute delight. Pretty much everything about it is old school quality and few games from the same genre and era are its equal (Alien Breed: Tower Assault perhaps pips it ever so slightly). So it is wonderful to see a developer take such good care over a revered retro artefact by making it available on a modern system, rather than attempt a potentially ill-fated remake. That it plays near enough identical to the original is utterly marvellous. Of course, some will quibble over the price for a game that is now 20 years-old and has no discernable differences. But these peeps are somewhat missing the point. The Chaos Engine is near-perfect gaming, from a great era of gaming and the fact the PC release is the Amiga version means you’re not paying for some sh!tty, b*stardised remake that is only similar in name. Like the recent Monkey Island and Baldur’s Gate enhanced editions, with The Chaos Engine you’re paying for the real deal, which really needs no air-brushing. So just buy it already! And if this endeavour is a success here is a shopping list for Mastertronic and Abstraction Games to consider for their next restoration – Turrican and Turrican 2 please! Cheers.